No more than a mile up the Bailleul road from Nieppe, this is Pont-d’Achelles Military Cemetery. 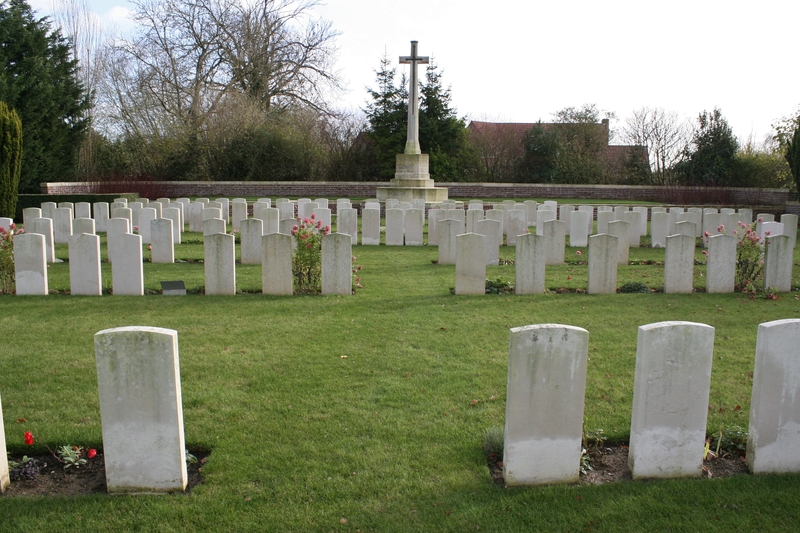 Unlike the other cemeteries we have so far visited in this area, however, it was much later in the war before this cemetery was begun, the first burials being made on 1st June 1917. 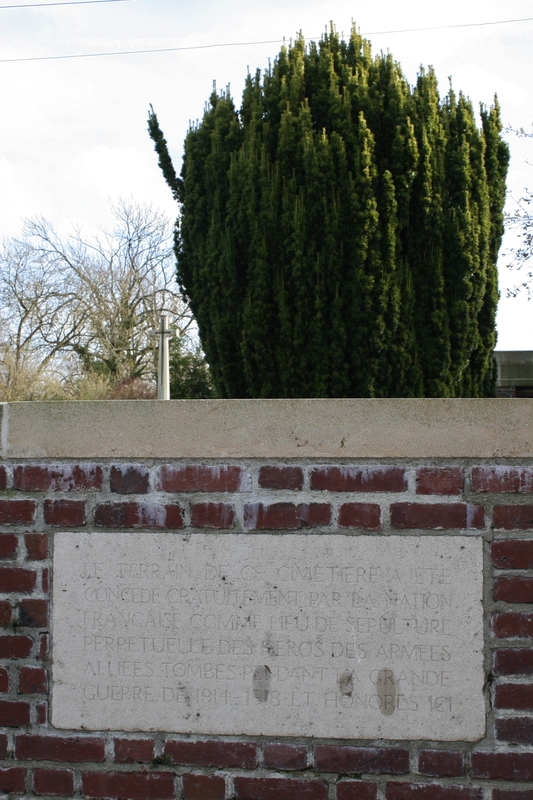 The ‘In Perpetuity’ tablet, the French version, is here inlaid into the exterior of the cemetery wall. Like Nieppe just down the road, Pont-d’Achelles was taken by the British on 16th October 1914 and would remain behind the British lines until 11th April 1918. 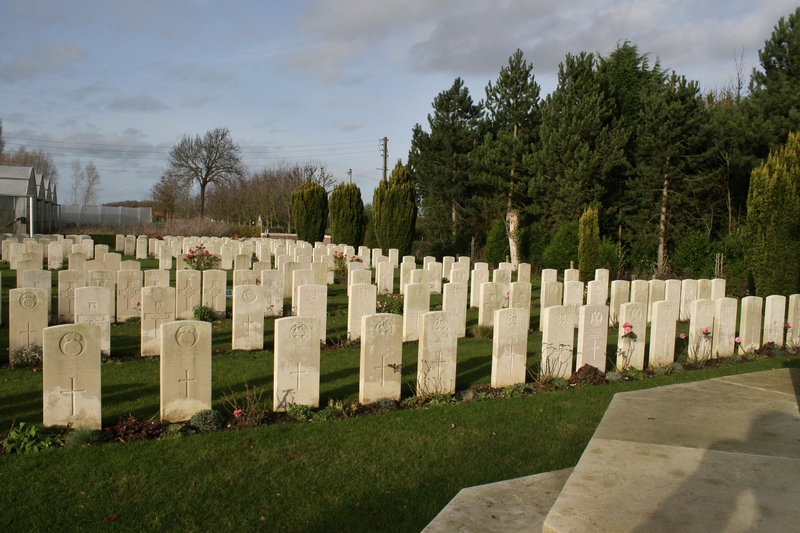 With the communal cemeteries down the road at Nieppe & Pont-de-Nieppe, and other cemeteries all along the line, already in use, there was no need for a cemetery here until the summer of 1917, when, had you been in Pont-d’Achelles (or pretty much anywhere in Flanders, actually), very early on a particular morning in June, whatever you may have been doing at the time your attention would have been drawn irresistibly towards the north east, as the earth beneath you shook, and the nineteen huge mines that presaged the beginning of the Battle of Messines lit up the night sky. Cemetery entrance. 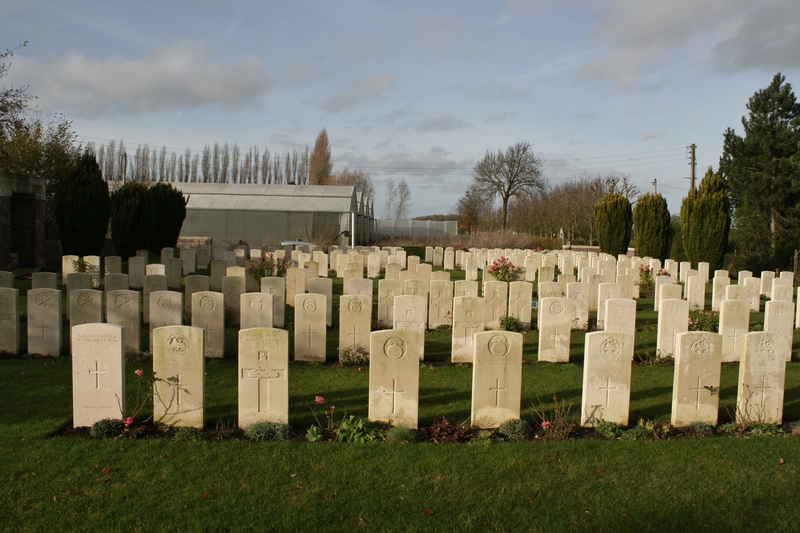 The Battle of Messines took place between 7th & 14th June 1917, and during the previous week, when the cemetery was opened, 21 men had been buried here, almost half of whom were artillerymen. On the opening day of the battle fifteen men either died here or were found to be dead on arrival, but after that only a further nineteen men were buried in the cemetery during the course of the battle, which, even in a battle that you are winning, seems to me to be an extraordinarily small number compared to the number of men who passed through here, a testament to the expertly organised evacuation system set up before the battle by the Deputy Director of New Zealand Medical Services, Colonel Charles Mackie Begg, about which more later. 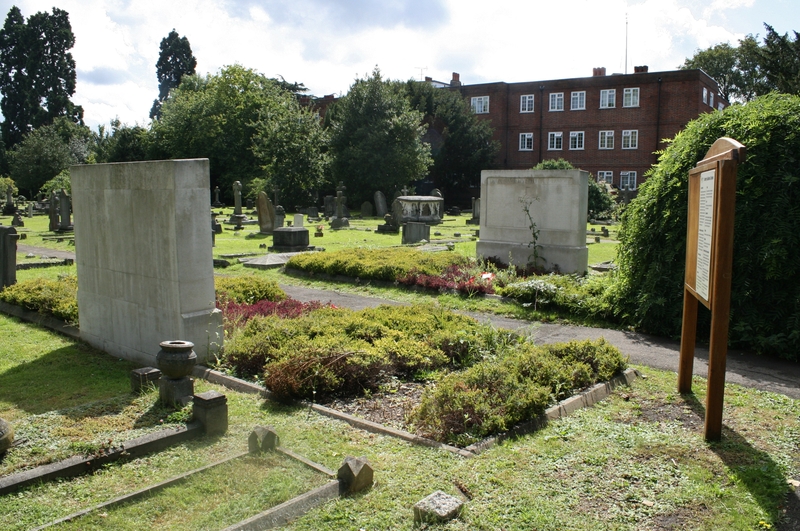 Panning from north west to south west (above & below) from the western corner of the cemetery; although the cemetery entrance is central, you must then follow the paving stones to left or right to gain access. 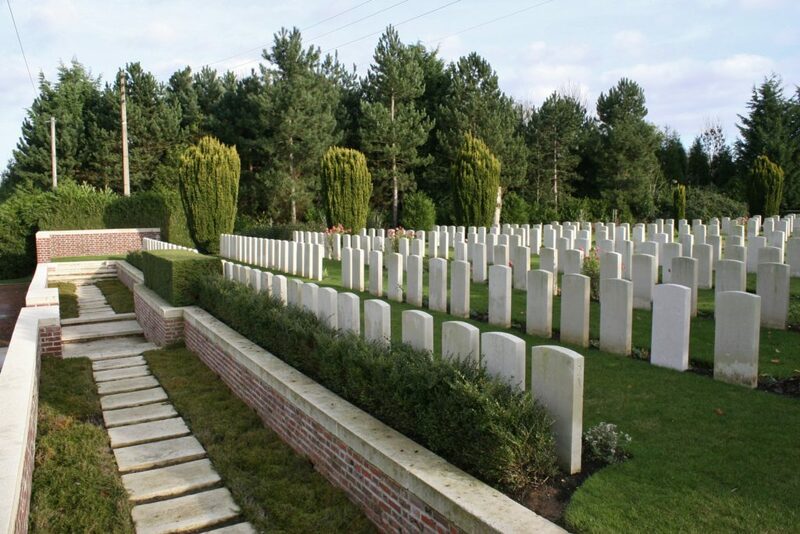 By the end of June 1917, the bodies of eighty eight men lay here, after which the cemetery was used on a fairly regular basis for the next few months and then occasionally until April 1918. 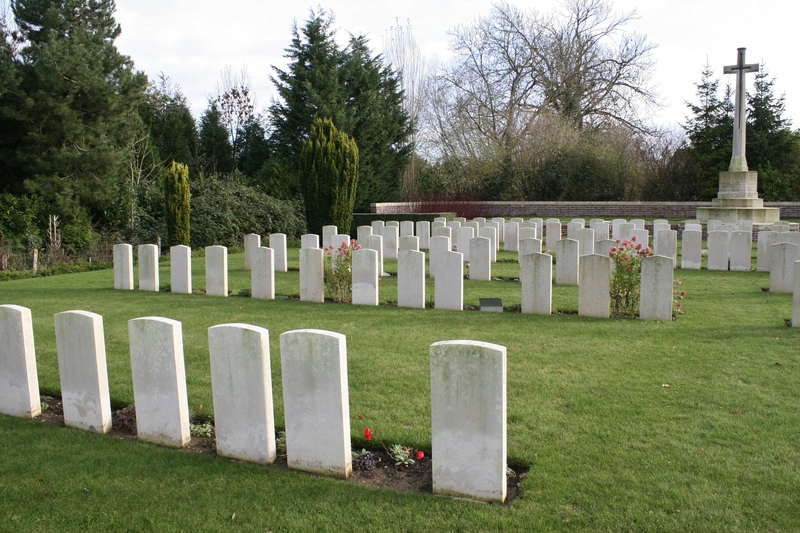 Early on 12th April 1918 two British soldiers were buried here, and by the end of the day the Germans had buried three of their own men in the cemetery as the British evacuated Pont-d’Achelles. 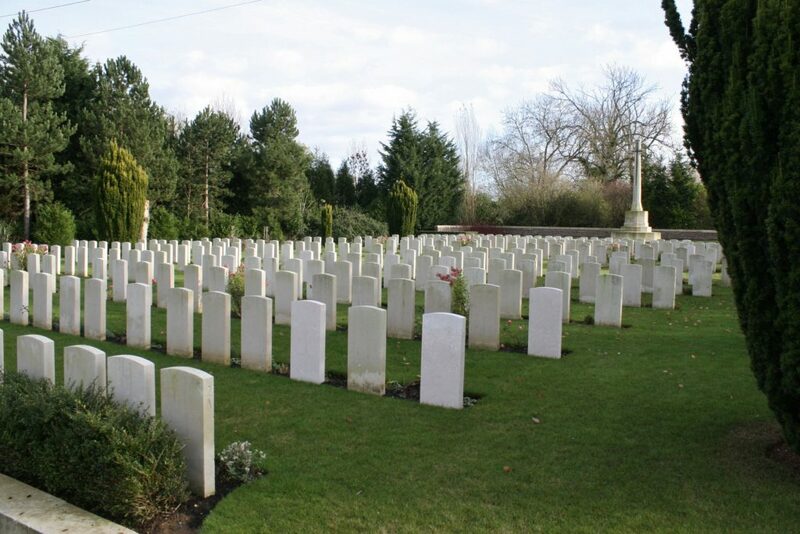 Over the following three weeks the Germans buried 33 more of their dead here, at which time they referred to the cemetery as Papot Military Cemetery, after which it was left unused until September & October 1918, when, after Nieppe was recaptured by the British on 3rd September, a further 86 British soldiers were buried here. In total 286 identified British soldiers now lie in the cemetery, alongside 37 Germans. 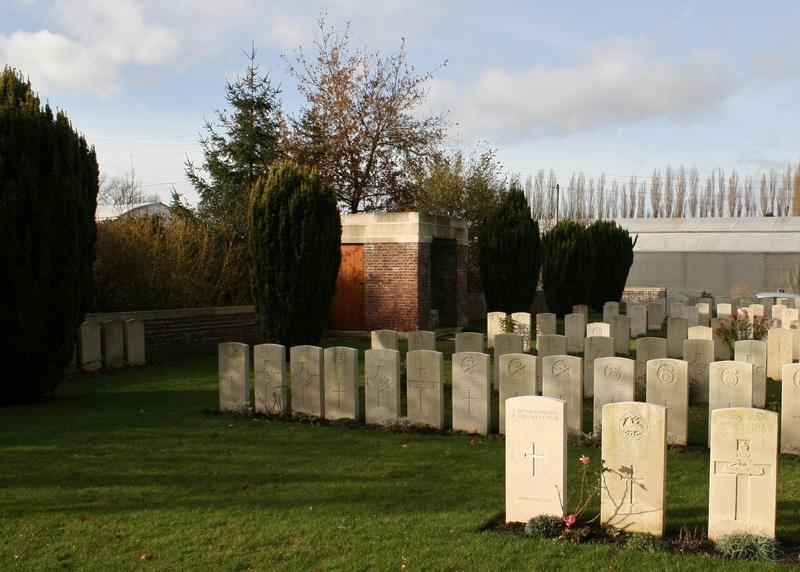 The cemetery is divided into just three plots, with the earliest burials near the cemetery entrance, and nearly all of the later, summer & autumn 1918 burials, both British & German, in Plot III nearest the Cross, as you can see from the cemetery plan. 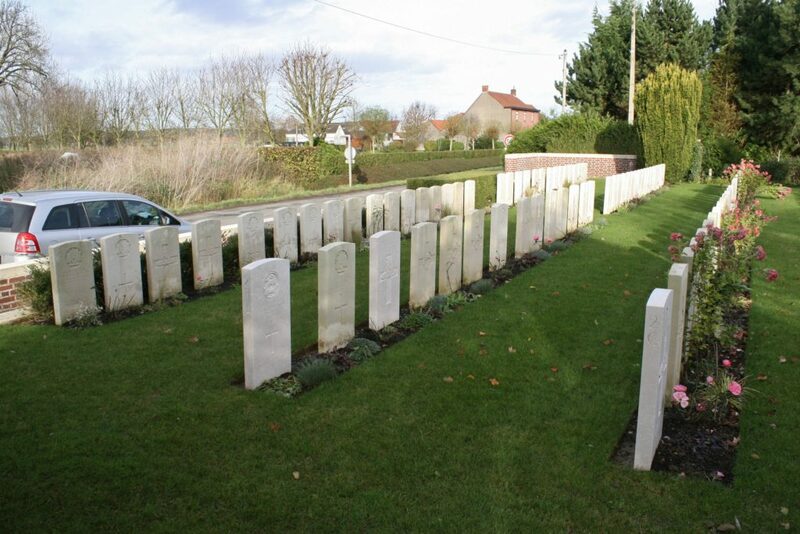 Now, considering the fact that all the headstones face away from us, as you will have spotted, it would seem sensible to make our way fairly swiftly to the far, south eastern end of the cemetery, and work our way back towards the entrance, don’t you think, while I tell you a little about the medical arrangements I mentioned earlier. Yes? Yes! In March 1917, with the military plans for the capture of the Messines Ridge and the elimination of the German salient well under way, the D.D.M.S. N.Z.E.F., Colonel Charles Begg, was tasked with preparing plans for the evacuation of the wounded during the forthcoming operations. 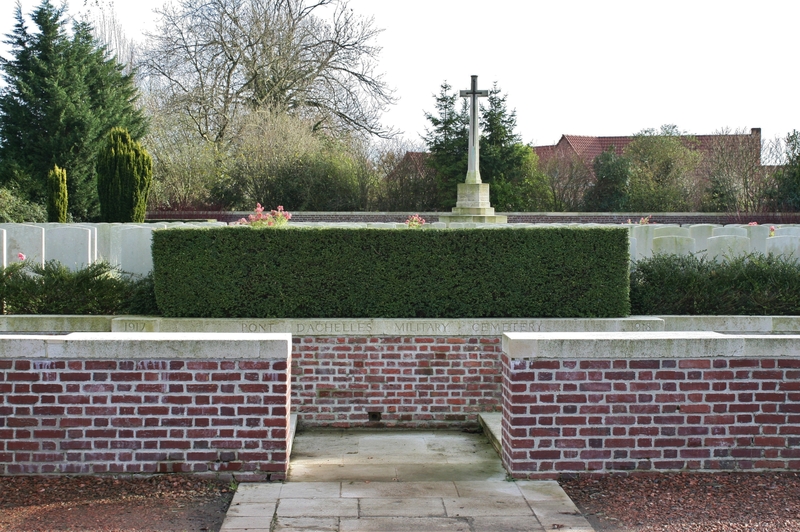 The Australian & New Zealand troops who would carry out the attack on the southern part of the ridge and the village of Messines itself (the operations north of the Kruisstraat mines do not concern us here) were already in their positions, and Begg personally inspected the whole sector whilst making his plans. He selected two sites for the Corps Main Dressing Stations, one, for the left, northern half of his sector, at Westhoff Farm on the road south out of Kemmel, and the other, serving the southern half, here at Pont D’Achelles. In collaboration with the Corps Engineers, Begg drafted plans that included, at each site, a total of 28 Nissen bow huts, six large ones for the reception, dressing, feeding and evacuation of the wounded, and 22 small huts and 25 large marquee tents for sick and gas cases, along with the requisite kitchens, bathrooms, latrines and incinerators, as well as roads and tracks for horse and motor-driven transport. The work was scheduled to be completed by mid-April, in the case of Pont D’Achelles, by men if the 3rd Australian Division. The ruins of Armentières were utilised as large quantities of bricks and rubble for road-making purposes were transported to the site each night by ambulance. These Corps Main Dressing Stations were big places! The system for evacuating sick and wounded soldiers, particularly during a battle, was a complex yet obviously crucial one, and not just for the wounded men, but for the morale of their colleagues, who could at least see, should they themselves be injured, that they would be looked after. A casualty wounded near the fighting would receive immediate treatment at one of the Regimental Aid Posts to be found in or just behind the front line, before responsibility was transferred from the regiment to the Royal Army Medical Corps and the casualty would be evacuated by stretcher bearers of the Field Ambulance (a mobile medical unit, not a motor vehicle!) to Advanced Dressing Stations and then on to Main Dressing Stations (such as here at Pont D’Achelles). There, more treatment could be received and the casualty, depending on the nature of his wounds*, could be transferred further away from the fighting to a Casualty Clearing Station, which, for the men in the southern half of the Anzac attack on the Messines Ridge, was the 2nd Australian C.C.S. at Trois Arbres or the C.C.S in Bailleul. 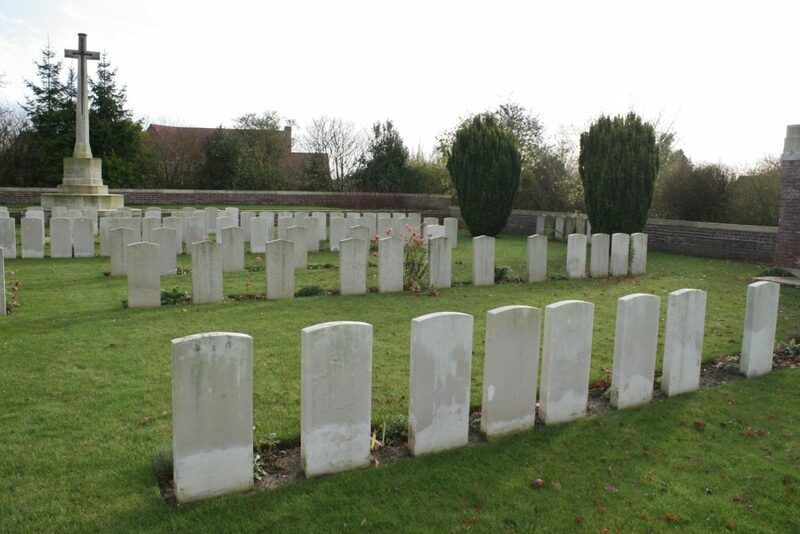 *Begg’s organisational plans included directing men with different wounds to Casualty Clearing Stations best equipped to deal with specific injuries. Walking wounded would be directed by strategically positioned medical orderlies along flagged tracks marked with whitewashed posts, for navigation at night, to a walking wounded Divisional Collecting Station, where their wounds could be dressed and they could get refreshment, and from where they could be evacuated either on foot or by car, or even utilising lorries returning from nearer the front line, to the Casualty Clearing Stations and the broad gauge railway entraining points further to the west. I have written previously about the evacuation of wounded men in this sector during the Battle of Messines, from Regimental Aid Posts at both Ration Farm and St. Quentin Cabaret, near the front lines, to the Advanced Dressing Stations such as Kandahar Farm, and you might find the post about Kandahar Farm, from where men would be transported directly to Pont-d’Achelles, of interest here (and there are maps!). 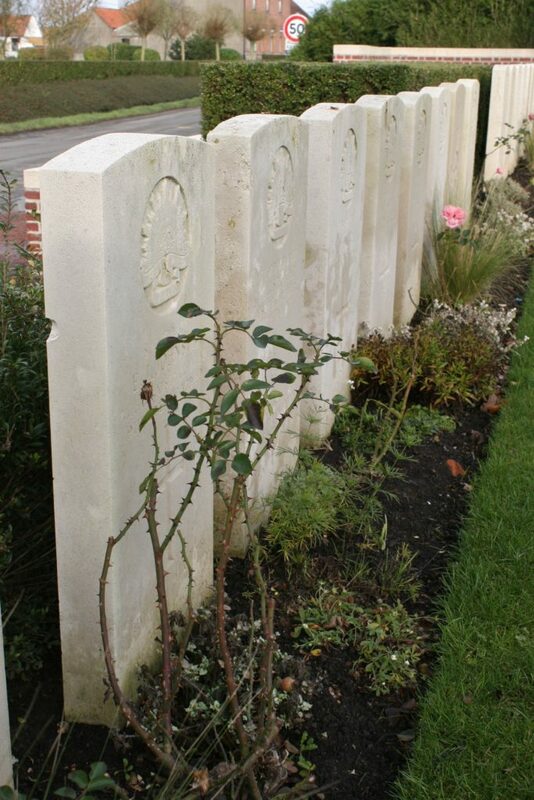 Men wounded on the south western slopes of the Messines Ridge would, with luck, find themselves at either of the two above mentioned Regimental Aid Posts, then on to the A.D.S. at Kandahar Farm, and from there they would be transported to the Corps Main Dressing Station here at Pont-d’Achelles. 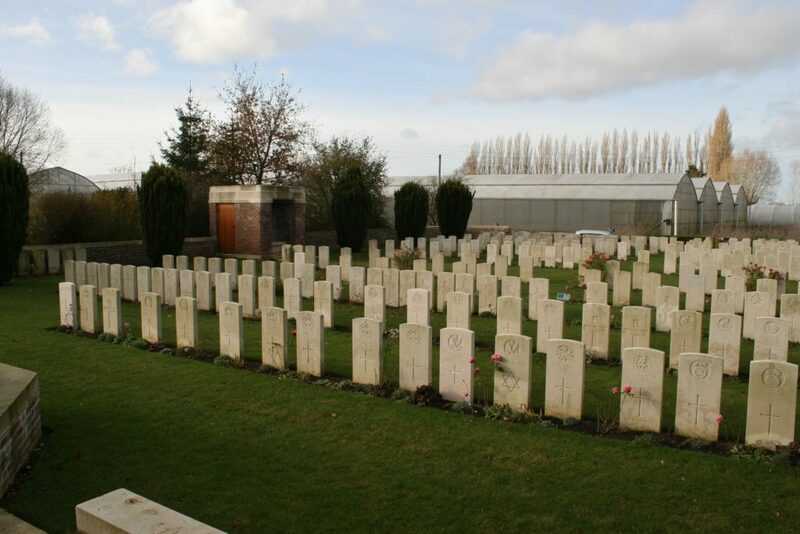 Remembering that we are talking about just one part of one sector of the attack on Messines, the statistics concerning the evacuation of wounded men in the New Zealand part of the attack are fascinating (honest Guv!). Begg’s preparations seem to have been excellent, as the medical services, like the rest of the attack, and despite the congestion that occurred in places on the first day, in general worked as smoothly as could be expected. By 6.30 a.m., just over three hours after the explosion of the nineteen great mines on the morning of 7th June 1917, more than 150 wounded men (of whom thirty were stretcher cases), had reached the A. D. S. at Kandahar Farm, from where light railways had been constructed to transport the men further west, and already some 500 troops, 200 of whom were gas casualties from 3rd Australian Division, had been received at Pont-d’Achelles Corps Main Dressing Station and were being sent to the Casualty Clearing Station at Bailleul. Extraordinarily, by 7.30 a.m. the first ambulance trains were steaming out of Bailleul station. The New Zealand part of the attack, as elsewhere, was proving successful and as the troops moved forward, the lines of communication, and the distance the wounded would have to travel for treatment, grew. By 8.30 a.m. the final objectives of the New Zealand Division were being consolidated, with casualties reported so far at about 1,200, including a few wounded Germans “the light and broad gauge railways were working well; the walking wounded entraining like a holiday crowd”. By noon, with the Division’s position now well established, some three hundred prisoners had been taken, along with numerous machine guns and a number of field pieces, and, as the troops advanced, new medical aid posts were being established in what was German territory just a few hours previously. By this time, 789 wounded (and 58 wounded Germans) had passed through Kandahar Farm, of whom 300 were walking, 188 lying and 243 sitting, and 375 walking wounded had found their way to the Divisional Collecting Post; all the while, going the other way, towards the front lines, ranks of men were carrying stretchers and blankets that were in constant demand at the Regimental Aid Posts. Westhoff Farm C.M.D.S. was experiencing some congestion, over eighty stretcher cases, dressed and fed, awaiting evacuation, and some 300 German wounded were still to be attended to. 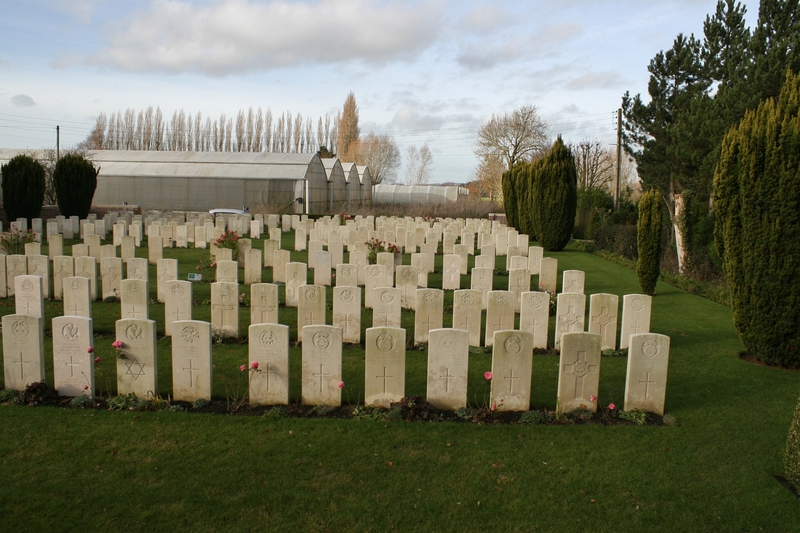 The congestion was quickly traced to the Casualty Clearing Station in Bailleul, where so many wounded men, rapidly evacuated from the battle zone, were now suffering unnecessarily as the convoy of cars carrying them could not unload, and Begg directed the stream of wounded elsewhere – in fact here, to the C.M.D.S. at Pont-d’Achelles. *the siding referred to was somewhere in the region of Pont-d’Achelles. 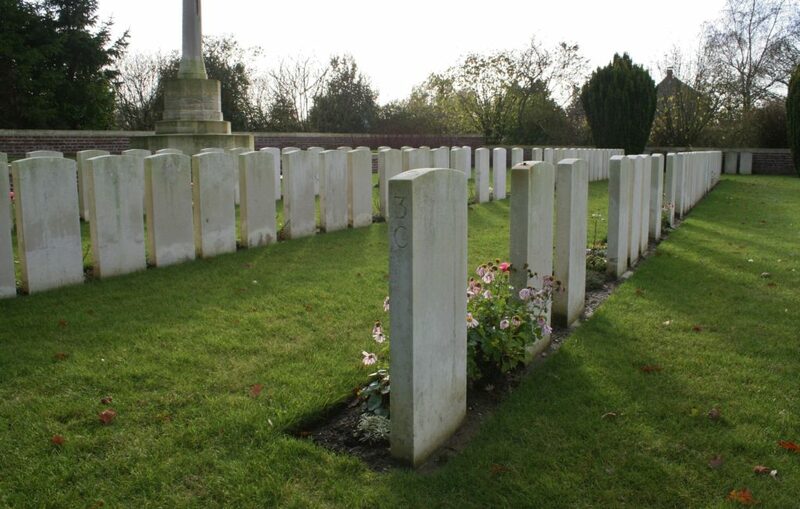 By the end of the day most of the forward Regimental Aid Posts had been cleared of wounded by Australian and New Zealand stretcher bearers, five of whom had been killed and ten, including a Regimental Medical Officer, wounded. The New Zealand Division had evacuated 60 officers and 1,884 other ranks by midnight on 7th June, 993 of whom had been tended at Kandahar Farm. Another A.D.S. at Underhill Farm on the north western edge of Ploegsteert Wood, where we visited some time ago, had by this time received 600. 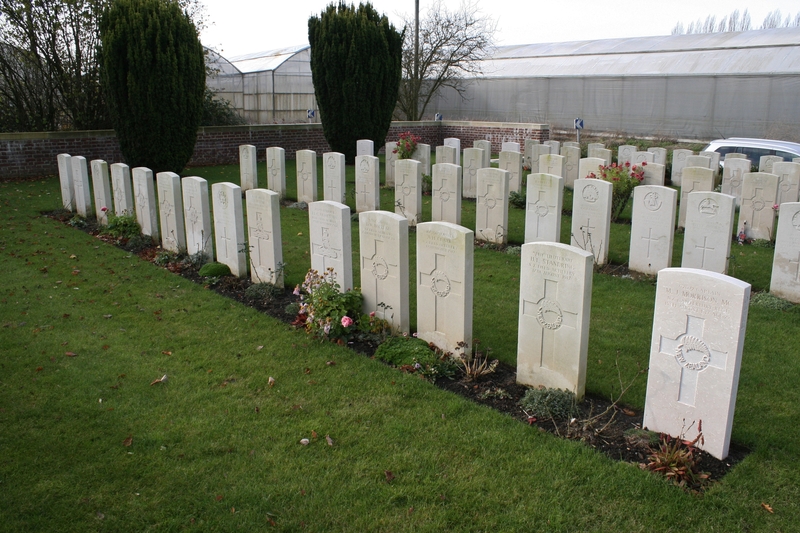 The Casualty Clearing Station at Bailleul was still hugely congested, so many of the wounded coming in by this time requiring operations before they could be transported west, that the surgical teams could not keep pace; 100 stretcher cases, mainly gunshot wounds to the head, were despatched to the C.C.S. 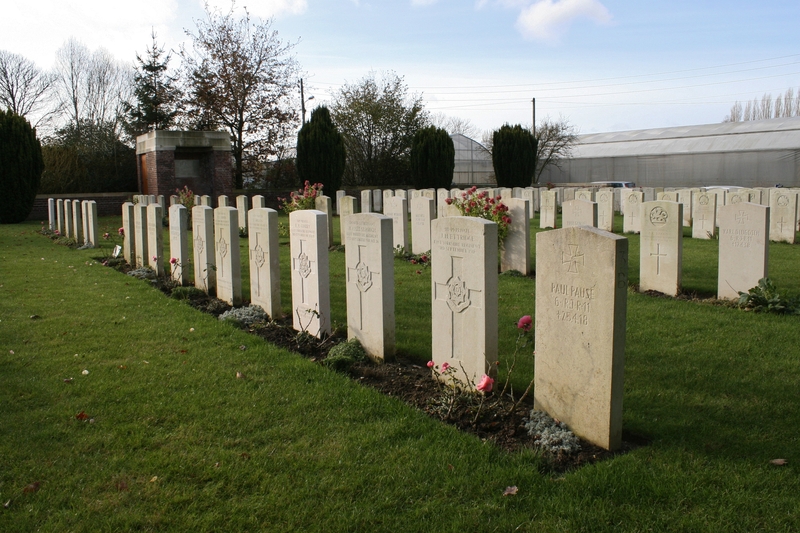 at Hazebrouk, where they arrived at 4.00 a.m. on the morning of 8th June; Hazebrouk had received just 187 wounded men (and ten sick) on the first day of the battle. And that was just day one. 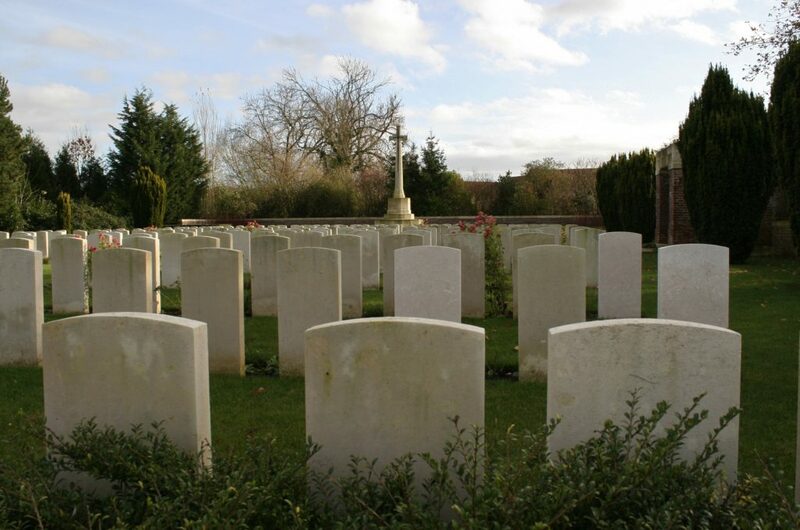 By sun up on the 8th June, all R.A.P.s were reported clear of wounded, over two thousand wounded men, of which 670 were stretcher cases, having now passed through Kandahar Farm. Later in the week the Australian 4th Field Ambulance would take over at Pont-d’Achelles, establishing a M.D.S. at Pont-de-Nieppe (from where they were subsequently shelled out, moving to Nieppe itself), using the routes of evacuation from Motor Car Corner and the A.D.S. at Brewery Orchard, all places we have visited during this or past tours. A light railway had been established leading to the C.M.D.S. at Pont D’Achelles. and during the course of the week long battle some 900 walking wounded, already fed before entraining, and with their injuries dressed, were detrained at Pont-d’Achelles. 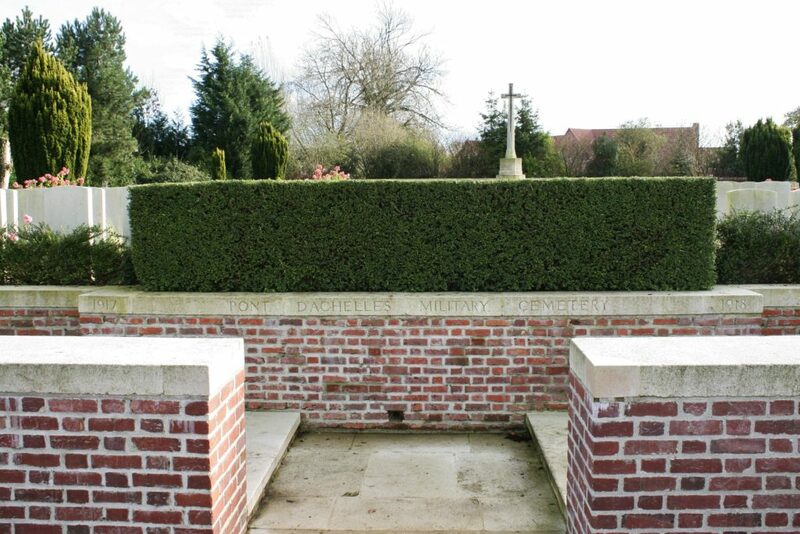 The eight German Special Memorials in the above picture (and also visible two photos back) are men killed in April 1918 and buried here whose graves have been lost; five of these men died on 13th April as the Germans advanced, and one the following day. A week after the fall of the Messines Ridge, the Australians operating the C.M.D.S. 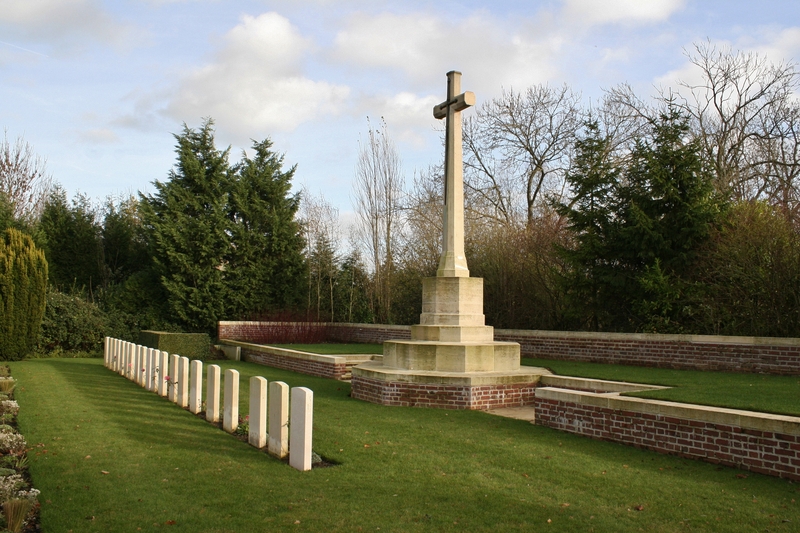 at Pont-d’Achelles were relieved by the New Zealand Field Ambulance, taking in men wounded during operations at Ploegsteert Wood, which had been taken over by New Zealand troops after the Battle of Messines. The Germans frequently saturated the wood with gas shells, keeping the Field Ambulance fully employed despite the official cessation of the battle. 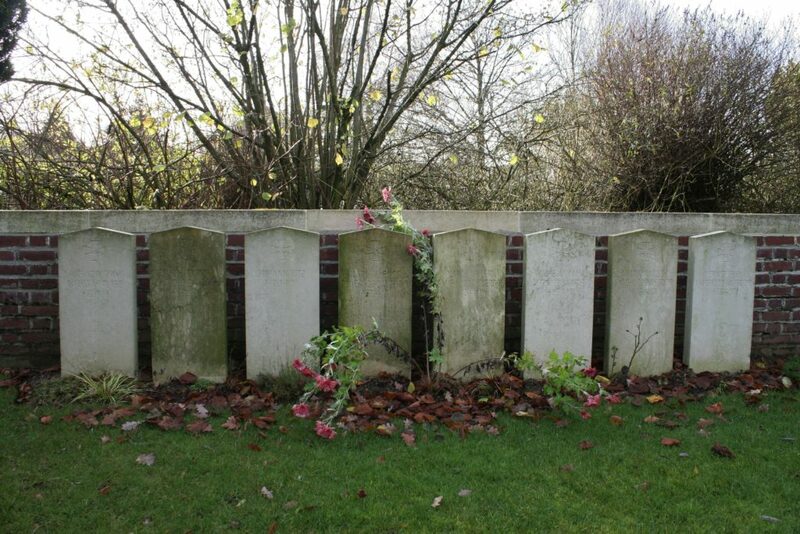 German graves in Plot III Row A (above & below), the five in the photo above next to one of only seven unidentified British burials in the cemetery. 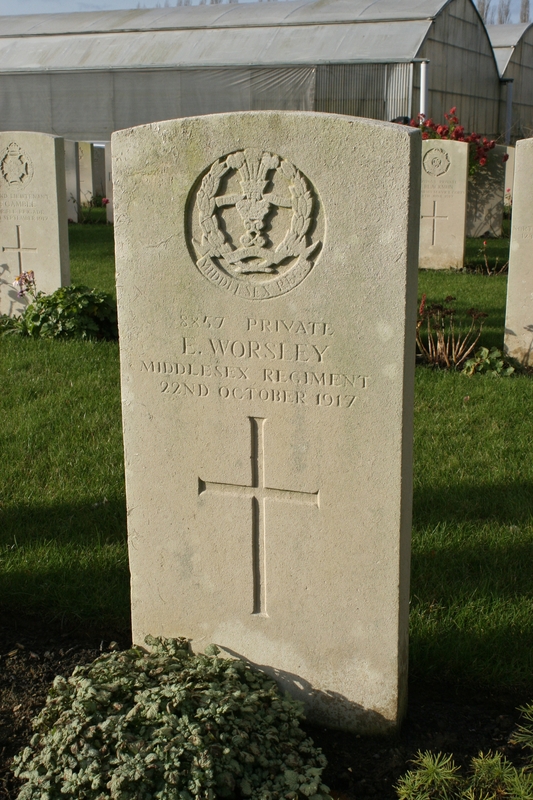 Private Ernest Worsley enlisted in the Middlesex Regiment at the outbreak of war in 1914, serving initially with 11th Bn. before being transferred to 2nd Bn. in 1916. In the autumn of 1917, Worsley was sent back from the front line to gather his company’s food rations, but failed to return. A week later, minus his equipment, he was arrested in Calais and subsequently sentenced to death for desertion. 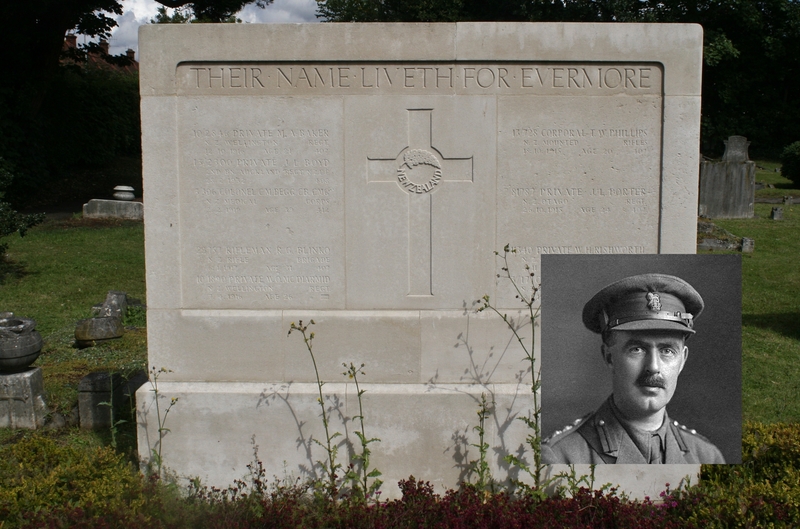 He was executed by firing squad on 22nd October 1917. 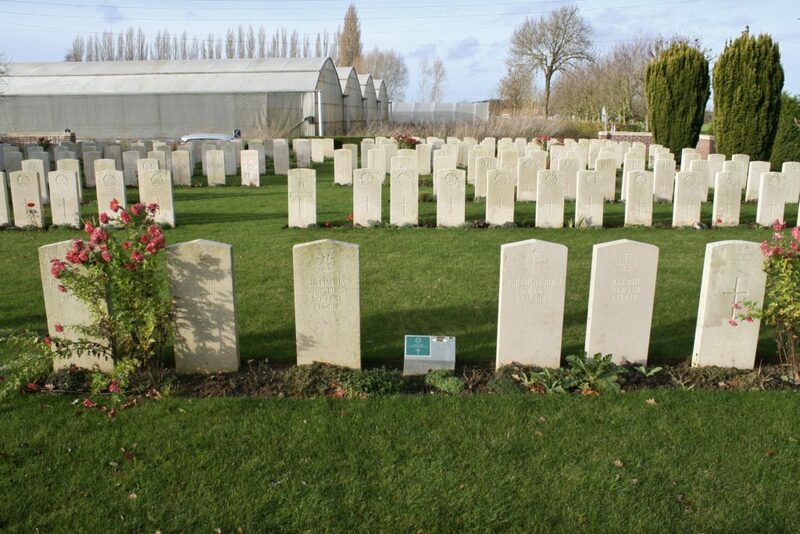 His body now lies here in Plot I Row F.
“One of the few cases of an enemy soldier with a bayonet wound passed through this dressing station [Pont-d’Achelles]. It was that of a fair-haired German youth, by that time a corpse, with a bayonet-thrust through the chest from beneath the right armpit. From this station the unit evacuated 6,040 cases of sick and wounded, and served as many as 698 meals in one day. The clearing station which received our casualties was that of the Australians at Trois Arbres, and one may bear testimony to the professional skill and extreme kindness that marked the attention of the Australians to the wounded of the New Zealand Division.” Where the fair-haired German youth now lies is anyone’s guess, as all but one of the German graves now in the cemetery are from April & May 1918 when the area was under German control. And so the war went on. Exceptional weather conditions prevailed during August 1917, with heavy rains, cold winds and frequent thunderstorms turning the land south of the River Douve into a swamp, filling the trenches with water. Winter precautions, including the use of rubber boots to prevent trench foot, cases of which were beginning to appear, became a necessity along with solidified alcohol for fuel, and pea soup tablets were issued for use by men sited in outposts. 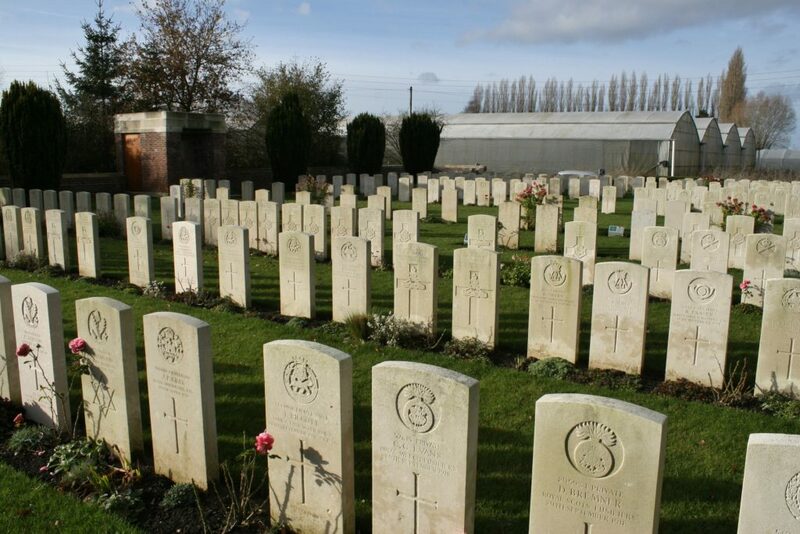 German artillery caused constant casualties; during the first two weeks of ‘this wretched month’, New Zealand casualties in the sector were 211 killed, with 941 wounded and ten missing, sickness also claiming 1,130 men. 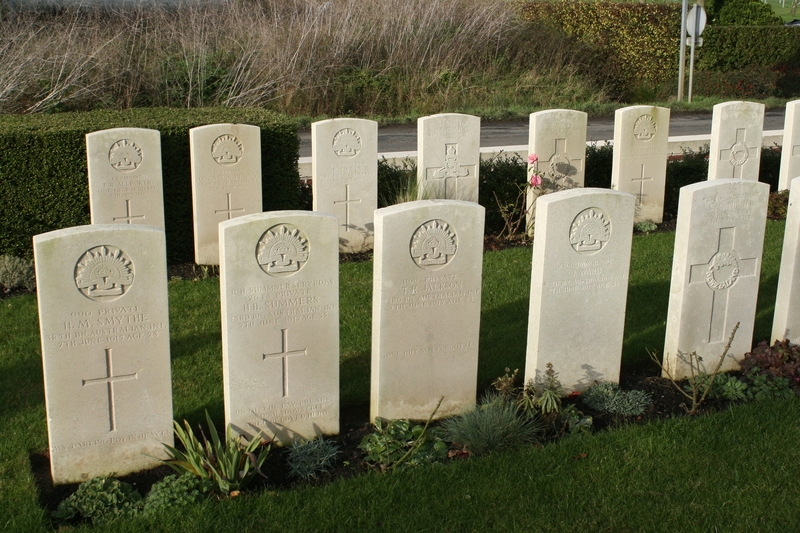 Australian & New Zealand casualties of 7th June 1917, the first day of the Battle of Messines, in Plot II Row B, with casualties from earlier in the week in Row A behind. 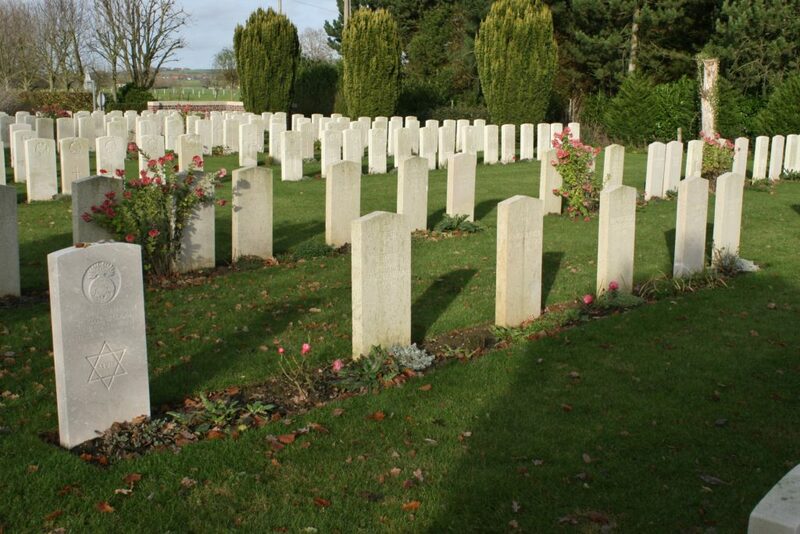 Note that two of the headstones in Row B bear no religious symbol. 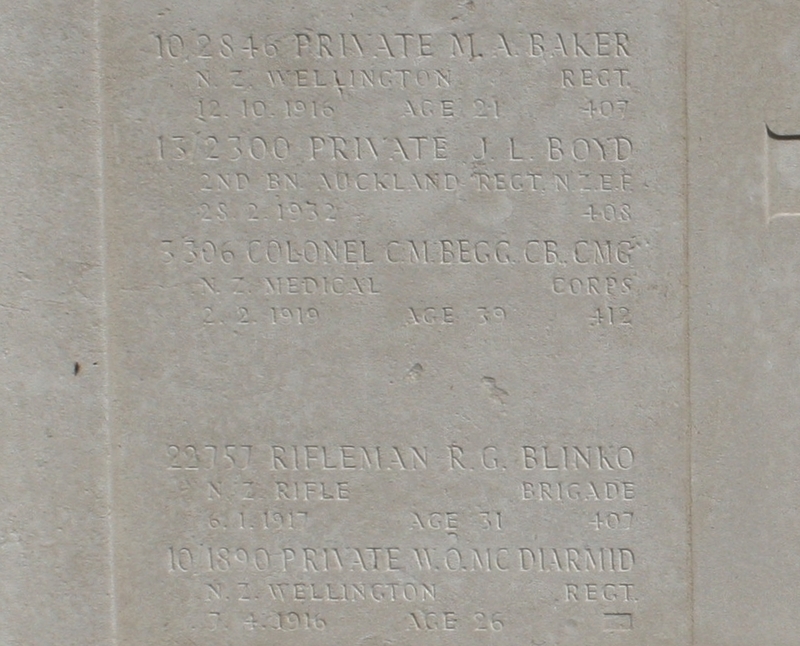 More Australian Messines casualties in Plot II Row B (below). As August dragged on, at Pont-de-Nieppe the famous baths were put out of action, another A.D.S. 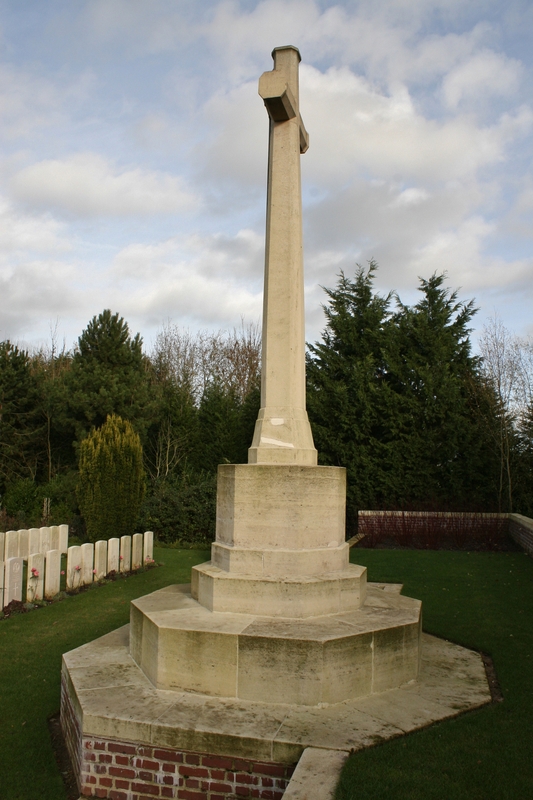 at Charing Cross in Ploegsteert Wood was receiving serious and accurate attention from German 21 cm howitzers, further to the west Bailleul was being shelled by day and bombed by night (one of the results of this night bombing was the catastrophic loss of artillery and field ambulance horses), and even Hazebrouk was subject to occasional bombardment by a naval gun firing at the impressive range of over twenty miles, necessitating the hurried evacuation of the New Zealand Stationary Hospital sited there. 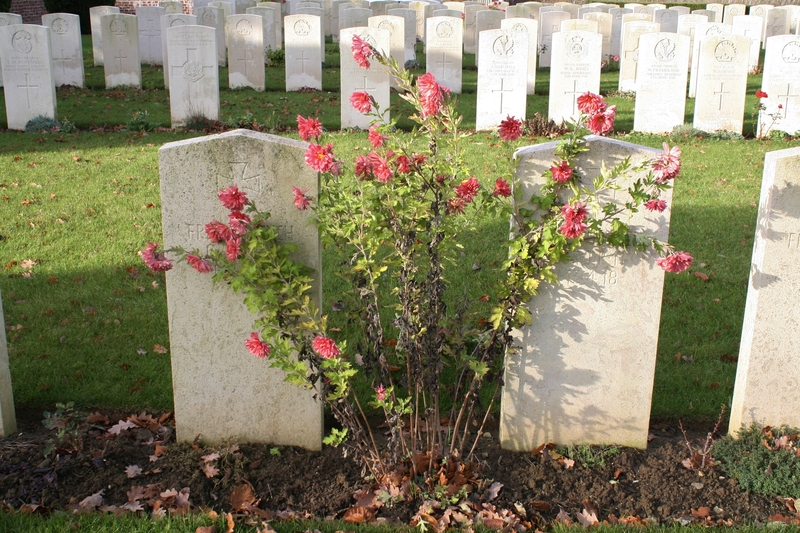 Battle casualties for the New Zealand Division during the month of August were 2292 soldiers incapacitated, a ‘wastage’ equivalent to 20% per month, or double that recorded for the whole of the division’s first year in France. And so the war went on. Before we leave, a little more about Colonel Begg He volunteered for service on the outbreak of war, leaving New Zealand with the main body of the N.Z.E.F. as a Lieutenant Colonel in charge of the Field Ambulance. Slightly wounded in the knee at Gallipoli, and temporarily invalided out with dysentery after the heavy fighting of August, he would return to the peninsula, remaining there until the evacuation. After further time spent in Egypt, and having been Mentioned in Despatches and received the C.M.G. for his service on Gallipoli, he landed in France with the N.Z.E.F., seeing action at Armentières and on the Somme in 1916. In October 1916 he became D.D.M.S. to the Second Anzac Corps (later XXII Corps), and was involved in the fighting around Ypres, and the Battle of Messines as we have seen, and later, during the 1918 German offensive, he worked in conjunction with the French Army in the fighting west of Rheims. Twice more Mentioned in Despatches, and awarded the C.B. for his services in France, Begg was promoted to Director of Medical Services, New Zealand Expeditionary Force, on 1st December 1918. 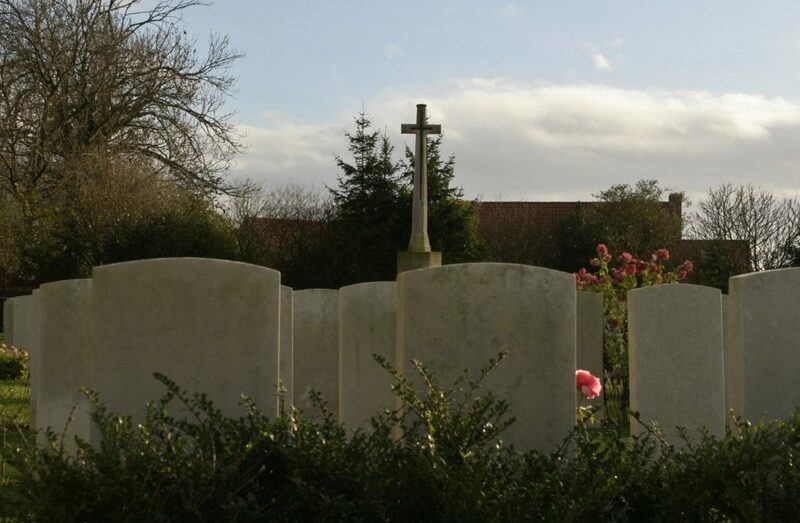 As a sad postscript, the master organiser and administrator who was responsible for giving so many wounded men a fighting chance would enjoy his new position as D.M.S. N.Z.E.F. for just two months. 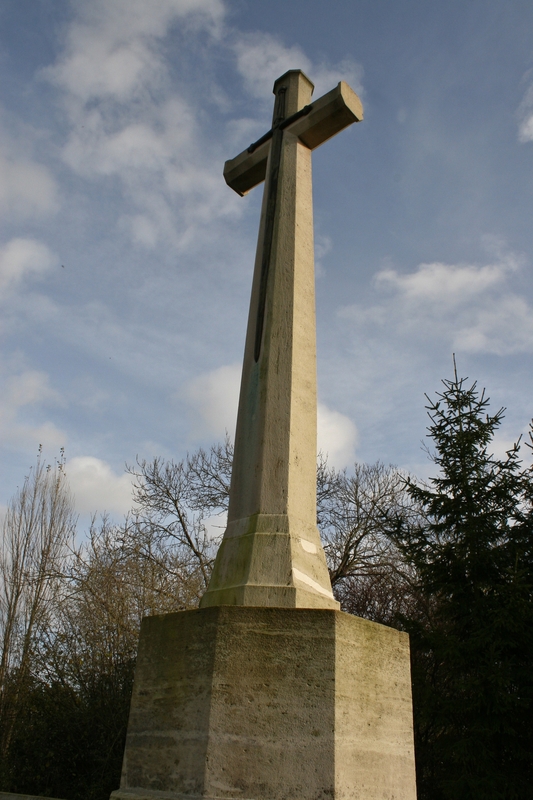 Colonel Charles Mackie Begg would die of pneumonia in Twickenham just outside London, following an attack of the dreaded influenza, on 2nd February 1919, aged only 39. He is buried in the churchyard at Walton-on-Thames (above & below), right next to where I once lived for a few years, alongside thirty other Great War casualties, his name inscribed on one of two screen walls that flank the central pathway. Time to move on. 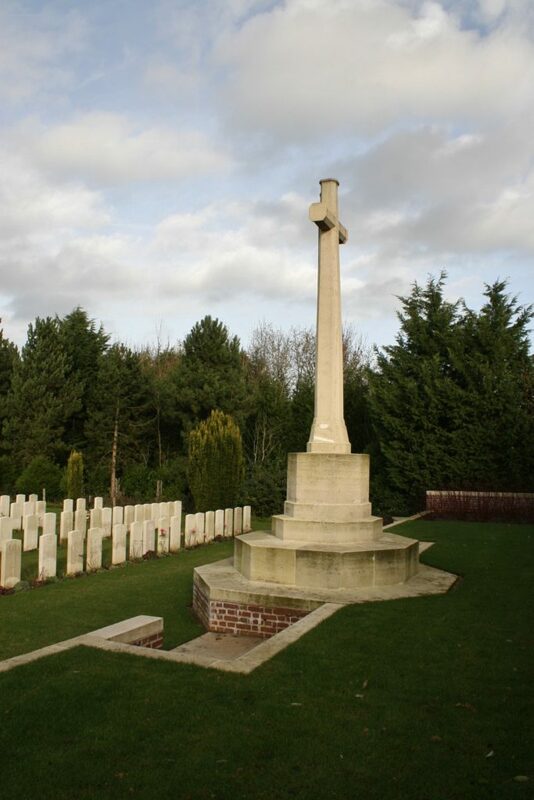 We shall now leave the main Bailleul road and head off south west towards Trois Arbres, on the road to Steenwerck, site of the Corps Main Dressing Station mentioned in this post, to pay our respects at the cemetery that grew up next to it. 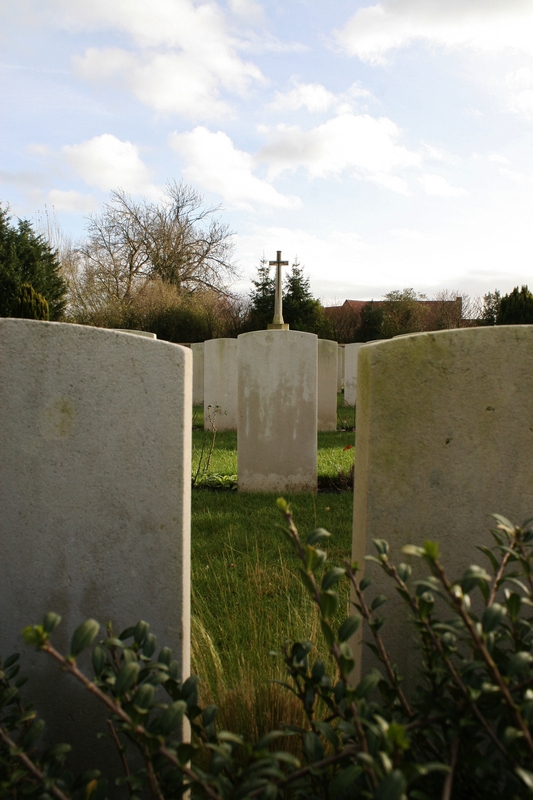 This entry was posted in Armentières to Steenwerck, French Flanders, Messines. Bookmark the permalink. Good afternoon Morag. As you will see, both your messages came through okay – there’s an occasional glitch, it seems, that sometimes tells people that their message hasn’t been sent – but it’s a lie!! Nothing I can do about it (it even happens to me sometimes when I reply to a message), but the messages do get through. Well, nine times out of ten, anyway. Lol! I will email Bernard shortly and see how I can help. Thanks for remembering (although I didn’t doubt that you would). Hi really interesting article. I was wondering if I could email you? Thanks, Richard, and sorry it’s been a few days, but have been in Belgian for a night & then France for a few days and only got back a few hours ago. If you will allow me to mail you – I have your address from your comment – then you will have my address to reply to. My great uncle is buried there killed September 12 1918 along with a number of other men. James R Stonall . thank you for the article it was very informative. And thanks for taking the trouble to comment Gary. Much appreciated.